we want to sync data to a client in a very flexible way - so we are playing around with a "Items_sync" table, that contains an entry for every user and every item they should download during a sync process. Thus, there may be multiple rows for the same user for a single item stating that she is allowed to download that item. Is user Andrew did not have access to item A, but then he is added to the administrators group (=> gets a corresponding Item_sync entry) he should download the item the next time he syncs. If Andrew had already synced item A and is added to the administrators group, nothing should be synced. --                  - and there is a deleted sync filter younger than "date"
However this performs quite badly due to the 5 usages of "exists" i.e. for 1 million rows in the main table, the query runs for 5 seconds and the STATISTICS IO output shows a looooot of reads, even if the query only returns a small subset of data. 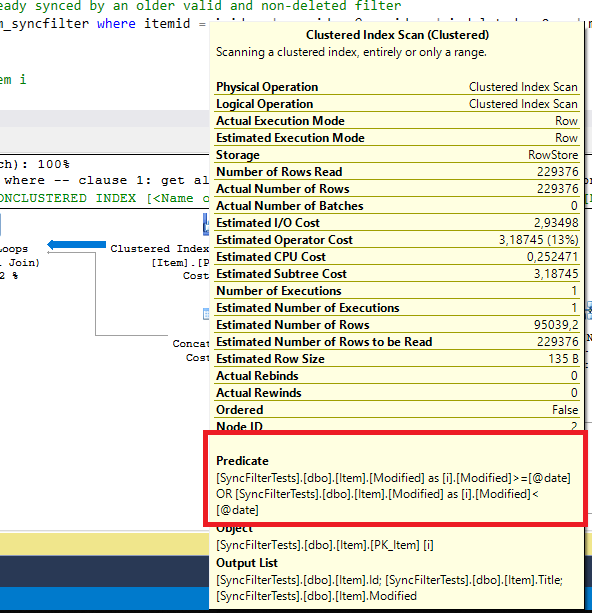 Can you give me any hint how we could improve this query dramatically? This creates 35K items and 350K syncfilter rows. Table 'Item_syncfilter'. Scan count 35013, logical reads 105648, physical reads 0, read-ahead reads 0, lob logical reads 0, lob physical reads 0, lob read-ahead reads 0. Table 'Item'. Scan count 1, logical reads 610, physical reads 0, read-ahead reads 0, lob logical reads 0, lob physical reads 0, lob read-ahead reads 0. I went along looked at the execution plan of the separate sub-clauses of the query. Table 'Item_syncfilter'. Scan count 1, logical reads 1433, physical reads 0, read-ahead reads 0, lob logical reads 0, lob physical reads 0, lob read-ahead reads 0. Table 'Item_syncfilter'. Scan count 1, logical reads 3, physical reads 0, read-ahead reads 0, lob logical reads 0, lob physical reads 0, lob read-ahead reads 0. ... so this greatly reduces the number of logical reads! Table 'Item_syncfilter'. Scan count 229376, logical reads 688128, physical reads 0, read-ahead reads 0, lob logical reads 0, lob physical reads 0, lob read-ahead reads 0. Table 'Item'. Scan count 1, logical reads 3980, physical reads 0, read-ahead reads 0, lob logical reads 0, lob physical reads 0, lob read-ahead reads 0. Table 'Item_syncfilter'. Scan count 3, logical reads 12, physical reads 0, read-ahead reads 0, lob logical reads 0, lob physical reads 0, lob read-ahead reads 0. Table 'Item'. Scan count 2, logical reads 8, physical reads 0, read-ahead reads 0, lob logical reads 0, lob physical reads 0, lob read-ahead reads 0. => so from 229376 down to 3, from 688128 down to 12, etc. This is a huge gain! Not the answer you're looking for? Browse other questions tagged sql-server sql-server-2008 data-synchronization or ask your own question. Finding distinct rows across two tables: Full Outer Join more efficient than Union?